It’s the end of week one and all seems well in the world of the Ness – and what a first week (site director Nick is looking very pleased!). All the backfill was removed in super quick time; grids re-established; site cleaned; scaffolding erected; new area opened up and is revealing roughly what was expected; work under way on hearths ready for archaeomagnetic dating next week etc. – and still the sun keeps shining. Interior of Structure Twelve is gradually revealed. Today, Structure Twelve is really motoring on, with Dave and his team removing more of the midden infill of the structure. A quick calculation from the full depth of the wall revealed in the robber cut, however, shows that there is still circa 25-30cms depth of deposits to move before we hit floor levels – a long way to go. Although mainly rubble and midden, some secondary activity within this building is also hinted at with the discovery of some wall lines that cut across the beautiful symmetry of its original overall plan – how long-lived these secondary features were will be determined by microscopic thin section analysis of any floor deposits, in conjunction with dating samples. Mike uncovers a cobble stone tool cache in Structure Eight. In the new trench extension, more pot and other finds are coming to light to go with the wall lines reported on yesterday. Intriguing are a few small sherds of pot that have quite pronounced cordons of applied decoration – are these the first evidence of Early Bronze Age activity so far recorded on site? Or another form of decorated Grooved Ware? The jury is out on this one. In Structure Eight, small bits of work are being done on discrete features uncovered before. Mike removed some rubble/collapse from the end of one stone pier and bets were taken about what may be revealed. 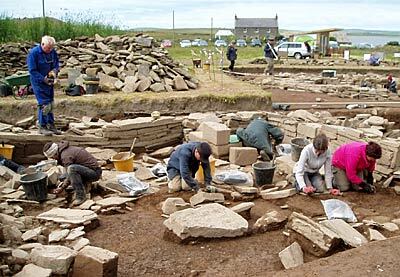 Judging by past experience in Structure Eight, would there be a macehead, polished stone tool or some equally exotic finds? Well, not quite, but a very nice cache of rounded cobble tools, neatly tucked away between the pier end and an adjacent orthostat. Elsewhere in Structure Eight, a flake of red stone, very similar to a beautiful, highly polished rectangular stone ‘tool’ discovered last year was found – could this be a fragment left from its production? Meanwhile, a rather unexpected find was made by Chris Gee. Just after he gave the lunchtime tour, Chris was standing next to the remains of the low drystone dyke, that originally defined the north-eastern side of the field, next to the finds hut, when a particular stone caught his eye. Closer examination showed that the sandstone block had been carefully dressed by pecking and probably had been part of one of our structures, probably Structure Ten. The whole dyke will now have to be scrutinised for further examples of Neolithic craftsmanship. 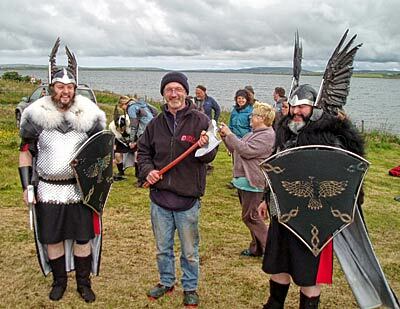 The Scalloway Viking Squad arrive in style. 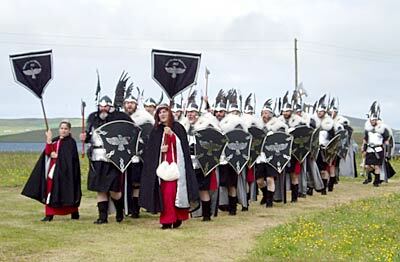 An added attraction today, for both the diggers and visitors alike, was the unannounced visit today by the Scalloway Viking Jarl Squad, from Shetland, who are a star attraction at the local Stromness Shopping Week. Arriving (3,000 years too late for the Ness) singing one of their traditional songs they made quite a spectacle and willingly posed for photos with many team members. And so to a quiet, well-deserved weekend off – at least for most, apart from Nick, who will welcome the contingent from Willamette University this weekend. Let’s hope the sun shines for their first encounter with Orkney. Excavation director Nick Card considers a new method to keep the team in order. Hello from Structure One. I’m Giles, returning for just a week this year to Ness. Last year, as a Masters student at Orkney College UHI, I had the privilege of spending six weeks excavating, interpreting and recording the occupation deposits within this fantastic double cruciform house. I am working elsewhere in Scotland, so it has just been a fleeting visit this year, but it has been a very productive week. As the covers come off the site again, I don’t think it ever fails to surprise anyone the depth and complexity of the buildings and deposits that we are dealing with. And excavating them is very much a process of inhabitation. The ways we enter houses, move around them and gaze into their hearths are the daily activities of our Neolithic ancestors. But enough navel-gazing for now! I have focused attention on the excavation and recording of the central hearth of Structure One. Its four substantial hearth stones contain a sequence of quite complex deposits, which need to be unpicked to try and understand the way the hearth deposits were formed. At a wider level within Structure One, with the excavation of its subtle layers of occupation deposits, we hope to be able to understand the sequence of household activity that this hearth formed a focus for, potentially over a prolonged period. 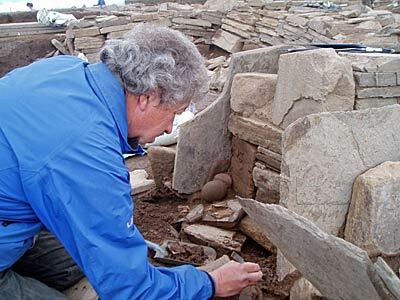 Ultimately, this represents why Ness of Brodgar is of paramount importance to our understanding of Late Neolithic Britain – a palimpsest of occupation deposits survive to be recorded and understood; these attest to both the everyday, as well as the very spectacular.